Explanation: Where are all of these meteors coming from? In terms of direction on the sky, the pointed answer is the constellation of Perseus. That is why the meteor shower that peaks later this week is known as the Perseids -- the meteors all appear to came from a radiant toward Perseus. In terms of parent body, though, the sand-sized debris that makes up the Perseids meteors come from Comet Swift-Tuttle. The comet follows a well-defined orbit around our Sun, and the part of the orbit that approaches Earth is superposed in front of the Perseus. Therefore, when Earth crosses this orbit, the radiant point of falling debris appears in Perseus. 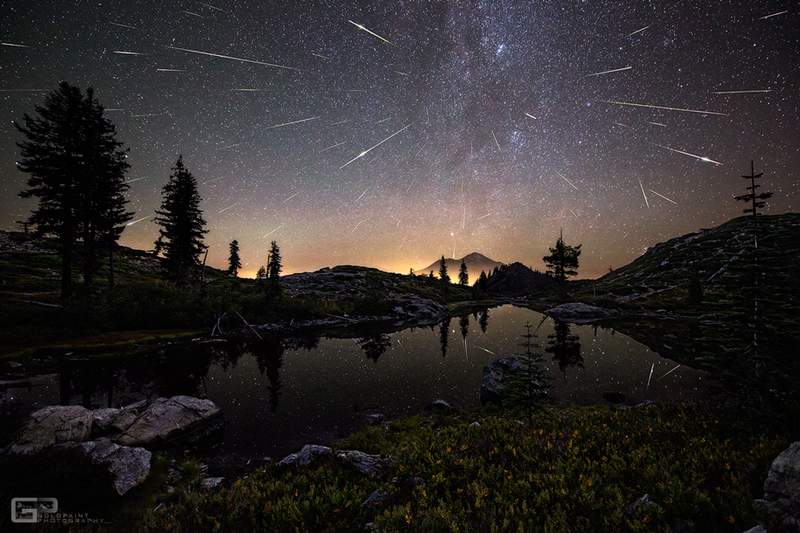 Featured here, a composite image containing over 60 meteors from last August's Perseids meteor shower shows many bright meteors that streaked over Mount Shasta, California, USA. This year's Perseids holds promise to be the best meteor shower of the year.